Inactivated vaccine against swine pleuropeumonia caused by Actinobacillus pleuropeumoniae. 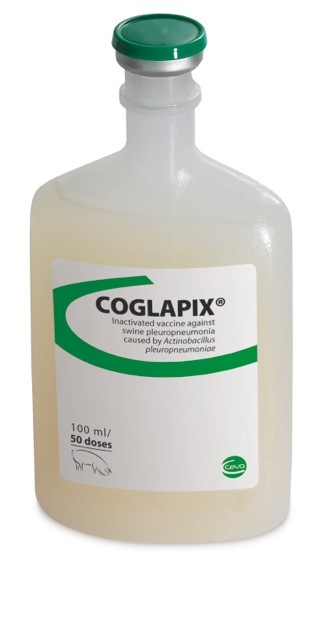 COGLAPIX® is the only vaccine based on bacterial toxoids, that provides a strong protection against all the serotypes of Actinobacillus pleuropneumoniae (A.p.) and without specific post-vaccination reaction at the same time. In front of the variability of the serotypes present in the field, only toxoid vaccines provide a universal protection. But one vaccine should be safe for the piglets at the same time what is usually a drawback of vaccines against A.p. COGLAPIX® associates safety with universal protection and efficacy. Vaccine containing Actinobacillus pleuropeumoniae strains, inactivated with formaldehyde, preserved with merthiolate and adjuvanted with aluminium hydroxide gel. The vaccine contains somatic antigens and Apx I, II and III toxoids of Actinobacillus pleuropneumoniae. It provides active immunisation against all known serotypes of Actinobacillus pleuropneumoniae. Active immunisation of swine against pleuropeumoniae caused by Actinobacillus pleuropneumoniae. A mild local reaction at the site of injection could be observed, which disappears within a few days. Before use, it is advisable to keep the vaccine at 15-25°C for 1-2 hours. Once a bottle has been opened, its content must be used within 24 hours; otherwise it should be discarded. Do not mix the vaccine with any other vaccines or drugs. The product must not be used during pregnancy and lactation. The bacterium Actinobacillus pleuropneumoniae (App) consists of at least twelve different serotypes, some of which produce no disease but others cause severe disease. Serotypes vary in different countries.